An article came out today in The Arizona Republic about Albert's chances at getting into the Hall of Fame. He will be on the ballot for the first time in December. The article mentions that Albert is a resident of Scottsdale, AZ and that he earned his accounting degree from LSU upon completing classes at ASU after he retired. Other topics tackled are Jose Canseco mentioning Albert did not take steriods in his book, Albert's thoughts on making the Hall of Fame, and his views on the corked bat issue. You can read the article at azcentral.com and refer to the quotes section for quotes from the article. I have not seen an article like this devoted to Albert in a while, so make sure you read it! Another article, from the Akron Beacon Journal, says the rumors about Albert being a potential investor in the Cleveland Cavaliers are false. You can read that article at the following address: http://www.ohio.com/mld/ohio/sports/basketball/nba/cleveland_cavaliers/10978535.htm?1c. Hey everyone, just wanted to update you guys about some things on my mind. I really, really want to re-vamp this site. I just don't have the time to do it right now. But, I plan to do things when I go home for summer break in May, so hopefully this site will become way better this summer. To do this though, I would like some of your feedback. Please feel free to e-mail me with any ideas you have for the site, or things you think I could do to make it better. Specific ideas I have are getting a message board and possibly getting a domain name. I've always wanted to, but I haven't had the money nor do I know how it all works. Perhaps I could look into it and afford it once I have a good job. When I started this site 6 years ago, I had no idea it would grow to the place it has grown to today, so for that I thank you all for visiting and utilizing this site. The second thing I wanted to tell you all is to keep anything that is extremely personal out of the guestbook. I have noticed some posts in there relating to Albert's personal business, and while nothing can be seen as either true or false, it is best left in private. Hopefully if I get a message board, you all could talk back and forth in there, instead of the guestbook. We shall see. Well, here is the new version of this site. I've spent the past week or so going through every page and all the information and just overall trying to improve the website. This has been one of the most fun projects I have ever worked on in my life and I hope that people will continue to visit for years to come. Also, I think my wrist is about to fall off, haha. Please, please, please give me some feedback on what you think.. and if you have any suggestions I would love to hear them. You can e-mail me, sign the guestbook, or post on the message board. Speaking of the message board, I'd like the discussion amongst the regular visitors to take place there. If you have any problems with how to use it, feel free to tell me. In Albert news, according to Skip Bertman in an article on CollegeSports.com, Albert was recently spotted in attendance at the Louisiana High School All-Star Game. Good to see that he is enjoying baseball in his home state. Updated Albert's stats today, adding his All-Star stats. 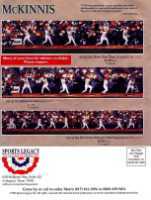 Thanks to Baseball Almanac... they were the only site that I was able to find All-Star Game stats on. Many thanks to "sc88ter" who signed the guestbook with some news. He/she informed me that there was an article in the Baton Rouge Advocate today about Albert's upcoming induction into the Louisiana Sports Hall of Fame next week. The article also mentioned that Albert had to move his wedding date up a week (to this week then?) from the 25th of June because it conflicted with the induction ceremony date. Additionally, the article referred to the girl as the former Melissa Galus. Well, congratulations Albert :-) Sorry, the girl in me can't help thinking that it is cute that Albert is getting married (or is married). I looked at the newspaper's website (2theadvocate.com), but could not find the article but I did find this article from the Lafayette Daily Advertiser, which has identical information. Additionally, please refrain from making comments that you know are not appropriate.. as I've said before, I don't want anything too personal posted on any part of this site (guestbook, message board). Thanks! Here's an article about Albert's talk with the LA media yesterday from The Town Talk: http://www.thetowntalk.com/apps/pbcs.dll/article?AID=/20050624/SPORTS/506240330/1006. Additionally, here are two articles that I found today. The first article is from the Shreveport Times and talks a lot about Albert's condition and his golfing. It also mentions that he feels should have stayed in Chicago (I understand why, but also-- I thought the Orioles were his dream team to play for?) and that he met his new wife in Chicago. Further, Albert says he's loving marriage and is happy he waited this long to get married. The second article, from the Chicago Tribune, gives confirmation that Albert was married last Saturday (June 18). Additionally, Albert mentions that he has a good relationship with Jerry Reinsdorf and is interested in owning a team someday. I might be back with more news later, about the LA Hall of Fame induction, we'll see. I'll keep you posted. Update, 10:30pm: I haven't seen any articles about today's ceremony.. but I found another intersting article to show you all, from the Times-Picayune (click here to read it). In the article Albert talks about why he did not like talking to the media and it also mentions that Albert recently got his degree from LSU. Congrats Albert! :) I will probably update the quotes sections sometime this week with selected quotes from all of these recent articles. As promised, here are articles about Albert's induction into the LA Sports Hall of Fame. All three are great articles. The first one is a Q&A from Albert's press conference the other day. It has a picture of him golfing on Friday. The second article is really cute (sorry for lack of a better word, haha), it talks about how active Albert was this weekend and how he spoke with a group of Little Leaguers on Saturday. The kids I guess were not around when Albert was in the MLB, so they asked questions such as "What position did you play?" and "How many home runs did you hit?" The article also has a picture of Albert signing autographs for some children. Lastly, the third article talks about the actual ceremony. Tony Rhodes, a long time high school coach, introduced him. I really liked a quote from Albert in this article, "I'll always be a baseball player at heart because I loved the sacrifice fly and the stolen base just as much as I loved the homers and the RBIs." So check out those articles, they're pretty interesting. Lastly, does anyone out there live in LA? I would love to somehow get a newspaper article or a newspaper with an article about this in it. I kind of have a collection of old newspapers articles that I want to frame sometime when I'm older to put up in a sports themed room.. so I would love to have an article from this ocassion. Well, e-mail me if you do, I'd pay for you to mail me it, thanks so much. Just updating with (you guessed it) more articles :) I know these articles are all about the same thing mostly, but with each one we learn something new it seems. The first one talks about how Indians management bought a full-page program ad saluting Albert on his induction into the LA Sports Hall of Fame. In a phone interview Albert said, "It was a really cool thing for the Indians to do. I didn't expect them to do it, but I certainly appreciate it. It means a lot to me." In the second article (scroll to the middle for the part about Albert) Albert mentions some information about his marriage and honeymoon plans. "I've been married a few days," he said. "We pushed back our honeymoon. Everything has worked out perfect. The wedding was tremendous. This is a fun weekend. Then to cap it off, I'm going to spend a couple of weeks in Hawaii." Also, Albert sent out a special thank you to all of his Louisiana fans, "I just want to say thank you for being supportive over the years. My career worked out a lot better than I thought it would. There were a lot of critics and people that thought I wouldn't make it. But I always had the support of people in Shreveport and Louisiana." Hey guys, I'm here.. sorry just really busy. I saw that they are airing the LA Hall of Fame Induction on TV (I think just in LA) and wanted to pass this along. It will air tonight at 9 pm on Cox Sports Television and will re run many times. The re run dates are: Friday, July 15 (6 pm); Tuesday, July 19 (Noon); Thursday, July 21 (8 pm); Wednesday, July 27 (10 pm); Friday, July 29 (6 pm); Thursday, Aug. 4 (8:30 pm); and Tuesday, Aug. 9 (9:30 pm). See the article here. If anyone gets a chance to see it let me know, thanks! Finally had a chance to update tonight. I added some quotes from recent articles into the quotes section. Haven't really heard anything new, if I do I'll be sure to post it. Well, I don't have any news for you.. but I do have to say that my heart goes out to anyone who has been affected the the hurricane. I'm actually posting today to say that my web host is changing some things so I'm being forced to either sign up for a pricier account or move to a different host... right now I am so busy, I don't even have much time to look into it, but I have a few weeks. I'm leaning towards staying with the same host.. it's just going to start costing me more a year. I think that I can get a domain name too.. so if I do that I'm not sure what it will be, or if I will even use it (just know that abelle.cjb.net should be the permanent URL redirect, no matter where the site switches too). So if you bookmark this site from it's real link, it will be changing soon. If someone has a domain name idea feel free to let me know. The new domain is up :) Ultimate Albert Belle is now at http://www.albertbelle.net. I intend to keep the domain name for a while, but just incase http://abelle.cjb.net should be the re-direct URL forever, incase I ever move to a different host or domain name. It may not come up in the search engines as that URL right away, but it should after a little while. Hi everyone... incase you did not know Albert is on the ballot for the Basbeall Hall of Fame this year for the first time. Here's an article if you're interested in reading more: John Rolfe: Belle's attitude has to be considered in HOF voting (did the author visit this site?? interesting quote choice haha). Jim McKinnis, a fan of Albert's, recently e-mailed me with some photography art he shot of Albert. He was hoping to show Albert his work, but sadly I do not know Albert.. so the best I can do is post it here and hopefully Albert will stumble across it someday. The first one is called the Art of the Hit, which Jim shot in 1996 in Arlington, TX. 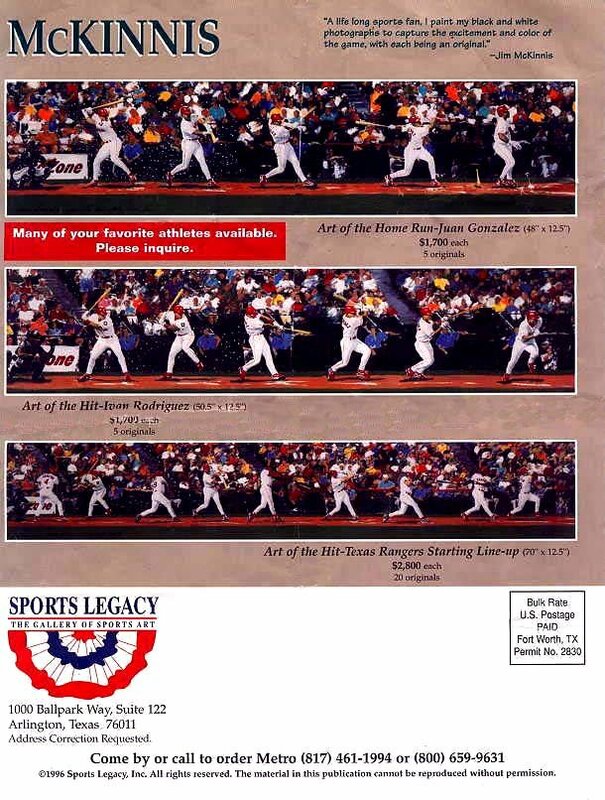 The three works on the back of the Sports Legacy gallery catalog from a year later (see images) were from the same night the Indians played the Rangers. The work measures approximately 12x48 inches and is a sequence of black and white photos he shot, printed and painted in his signature style. If there is interest, Albert can contact Jim by email at jamckinnis@sbcglobal.net. More of Jim's work can be viewed at this site: www.grandslammall.com/Item2Up.asp?WPID=4&DeptID=4&DeptAreaID=1. There was a nice article about Albert and his Hall of Fame potential today on MLB.com. Check it out: Belle likely to get some Hall support.